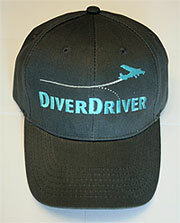 Want to support DiverDriver and get some cool swag in return? 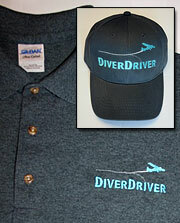 Show everyone you support safe DiverDriving with these high-quality hats and shirts! All orders ship for $6.00-$9.00 within the U.S.A. only. Sorry, no international shipping at this time. We have ladies’ polo shirts as well; email Chris if you are interested with the size you would like. $25 + $6 shipping and handling. 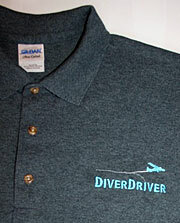 Also available are black fleece jackets that look very sharp with the DiverDriver logo. $45 + $9 shipping and handling. If you’d like your name monogrammed on your jacket it will be $8 more. Gray baseball cap with adjustable fabric strap in back and DiverDriver logo embroidered on the front. One size, $20 each. Buy both hat and shirt together for the complete look! DiverDriver.com has been maintained as a labor of love (read, at Chris’s expense) since December 2000. If you find this website useful, please consider a donation to help fund its maintenance. You do not need a PayPal account in order to use PayPal. Thank you so much for your support of safe flying!